Open. Alive. Here. So far. Now. 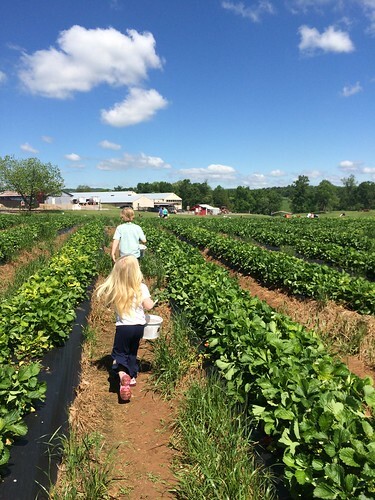 We spent part of our day at the small strawberry farm that we visit every year. It is close to home and familiar, and by now, the kids know its hilly landscape and gravel drive. We arrived around 11:00am today, and Georgia springtime showed up for us in her very best way. It’s the beginning of the growing season here, so many of the berries are still firm and green, and it took some hunting to find red ones. They were there though, shining like jewels under the wide green leaves. The kids would spot one far away and take off running to get it. It took us a while to fill two large buckets, but eventually we did. 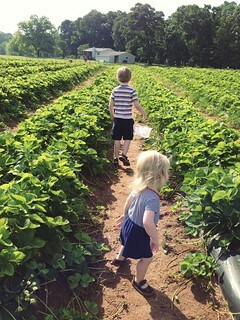 We followed berry picking with a little time in the farm’s petting zoo and playground, and we ended up on a wagon ride where we ran into neighbor friends. I can hardly believe the community that emerged for us in the past year or so. It’s a natural thing, nothing spectacular. But this house and these sweet spots so close to home and these friends we’ve made — they’ve all worked together to build roots when I didn’t even see it happening. And now here we are, settled in our lives as a family of three. Watching seasons come with familiar sights and faces. It’s all so ordinary, but it feels miraculous sometimes. Simple things fascinate kids at these ages. I know this is a limited window in the grand scheme of things. I’m glad that — despite the chaos and demands of life with two little ones — the joy is easy to come by. 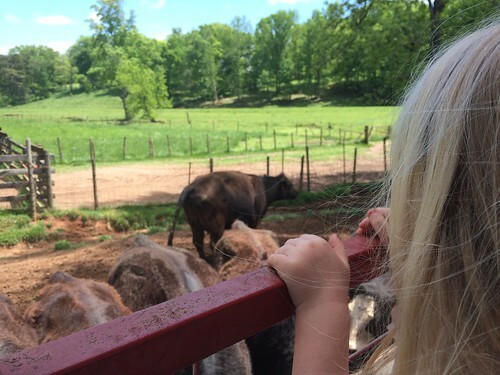 Any little trip to see something new can feel like such a treat to them. 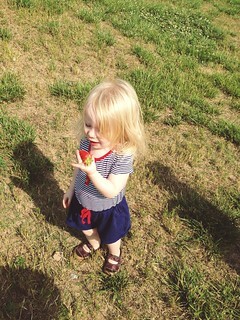 We arrived home three hours later with pink cheeks and more strawberries than I know what to do with. My two shared berries with neighborhood kids on the back patio while playing with sidewalk chalk all afternoon. I could hear them scheming elaborate ideas with friends just as I remember doing the same with my cousins when I was younger. They made their own bird feeders from ice cream cones with peanut butter and birdseed while we were at the farm, and this afternoon, we hung them on the tree I can see from our kitchen window. Today wasn’t all perfection. Their sibling bickering this morning almost killed me. I’m bone tired and was relieved to get them in bed asleep tonight. I’m listening to the dryer hum right now as I’ve settled in to write a bit, and I’m thinking of the mountains of laundry still left to do this weekend. The sticky floors I need to deal with tomorrow. I’ve got stacks of essays to grade and more coming in on Monday, and the final deadlines of the semester are looming over me and feeling impossible. I’ve got bills and worries and so many unanswered questions as I look at the stretch of weeks in front of me. But the universe just delivers sometimes when you’re paying attention enough to see it. 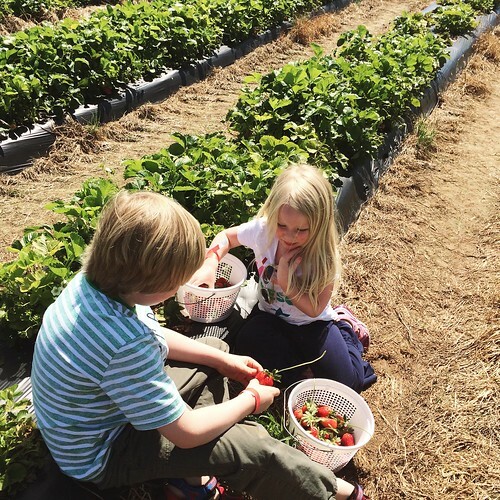 The sunshine, the spring breeze outside all day, the berries, their intent little faces as they hunted for the ripest ones. It pierces in the best way when I let it. As for the never-ending stress amidst the rest of my life, I don’t know. But spring Saturdays don’t happen often, and today we honored what was here for us. In her poem “Landscape,” Mary Oliver writes, “Every morning I walk like this around / the pond, thinking: if the doors of my heart / ever close, I am as good as dead. / Every morning, so far, I’m alive.” That’s all I can say sometimes, but I’m finding that it’s all that matters, too. Open. Alive. Here. So far. Now. Summer is coming. It’s about to bust wide open in that way it always does in the deep south. Produce stands are popping up along roadsides already, and soon enough the days will stretch long and hot. Here we go again. Like every year before but like something completely new. We are on summer break, and as I read a little outside on the porch yesterday while Jude played and Norah napped, I was reminded of what a gift it is to work only 9 months a year. I will never get rich in academics, but I have a passion for what I do and as a very special bonus, I get these months off every year to exhale and re-center and spend time with my kids. It really is the perfect balance for me. My first year back at work has come to an end, and on the whole, it went really well. It feels good to have it behind me. 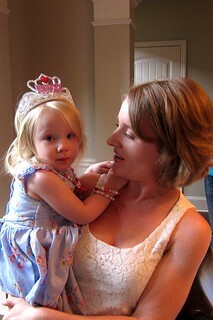 Last weekend was busy with the birthday of one very shy little girl. It astounds me how talkative and energetic she is when it’s only us hanging out at home – yet how incredibly shy she is in a crowd. 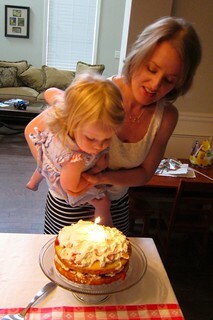 We had such a small party this year, and she was still bashful when her big moment came. As the week went on, I’ve crossed a few things off the to-do list with a check-up for Norah and a dermatologist appointment for me. 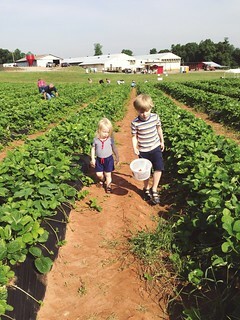 But we also managed to squeeze in a morning of strawberry picking as well. 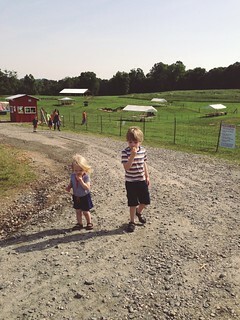 This little farm is only a short 25 minutes up the road for us, and it was small and manageable with two kids and one mom. We had a great time. 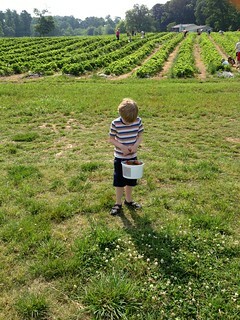 Jude was really interested in it this year and a great berry-finder. I was genuinely impressed with his determination to only pick the very best ones! We ended up with a full gallon, and he was really proud. He’s been asking a lot of questions lately about where his food comes from, and he’s taking a new interest in gardening ideas. It’s sparked some really fun moments in the kitchen and outside. So summer has begun in the very best way, and we are enjoying it already. We have all of next week to be lazy and get excited about our trip to Mexico next month. More soon, friends.